Nothing short of a wood-burning oven can top the taste of pizza fresh off the grill. Sure, getting it on the grill in one piece can involve some spatula gymnastics, but smaller pizza sizes with less toppings can solve that dilemma. Unless you're like my family, then you need it plastered with cheese and meat. 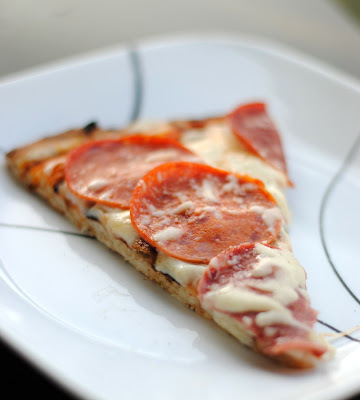 But you're still best to be light on the toppings to avoid soggy crusts. Want to try? It's as easy as 1-2-3! First, you heat your bbq to 400F - 425F. Roll out your dough, turn the heat down low, and grill one side until golden brown (about 2-5 minutes) and remove from the heat. Second, just flip it over and add your toppings to the grilled side. Third, you barbecue it again over a low flame (the oven temp should be the same as step 1) until the cheese is melted and the crust is golden brown on the bottom. It takes hardly any time compared to the oven, and the pizza is infinitely better. Go take advantage of this awesome summer weather and grill yourself a pizza!